Robinson Butchers and Deli in Tettenhall Wolverhampton have won the Taste of Game sponsored Best Game Product at the Q Guild of Butchers Smithfield Awards for their Huntsman Pie. Thirteen artisan butchers have been crowned top of their class, by celebrity chef and broadcaster Matt Tebbutt at one of British meat industry’s most prestigious awards ceremonies. Run by the Q Guild of Butchers, the Smithfield Awards are widely regarded as one of the meat trade’s most high profile and challenging product evaluations. Recognising and rewarding the best meat products from its countrywide members these awards showcase their butcher’s craftsmanship, innovation and skill. Running for over 30 years, the awards were announced on 30th January 2019 at Ironmonger’s Hall, one of London’s top twelve prestigious livery halls. Traditional family butcher J A McMurchie Meat of Hetton-Le-Hole in Tyne & Wear was crowned the overall Supreme Champion for the second year running with their new kitchen ready meal idea. The ‘Shepherd’s Purse’ is an oven-ready meal brought together in an oven-able pouch. The ‘Purse’ contains a Northumberland lamb shank with Chantenay carrots and maris piper potatoes in a classic mint sauce for a quick and tasty yet wholesome meal. 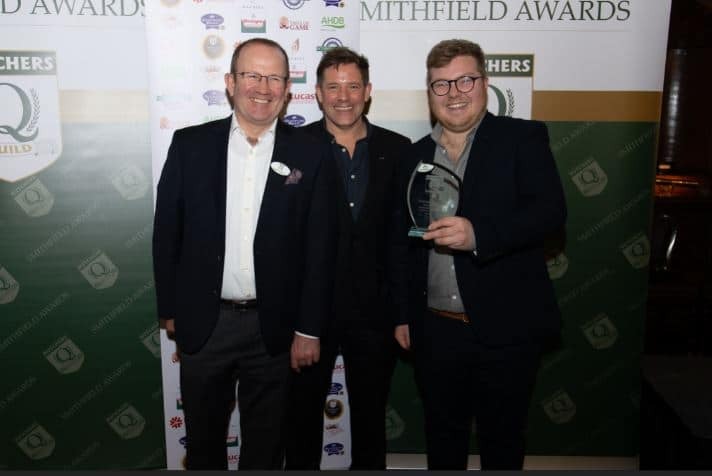 Matt Tebbutt awarded each category winner with a Diamond Award and J A McMurchie Meat took home the coveted title of Smithfield Awards Supreme Champion.